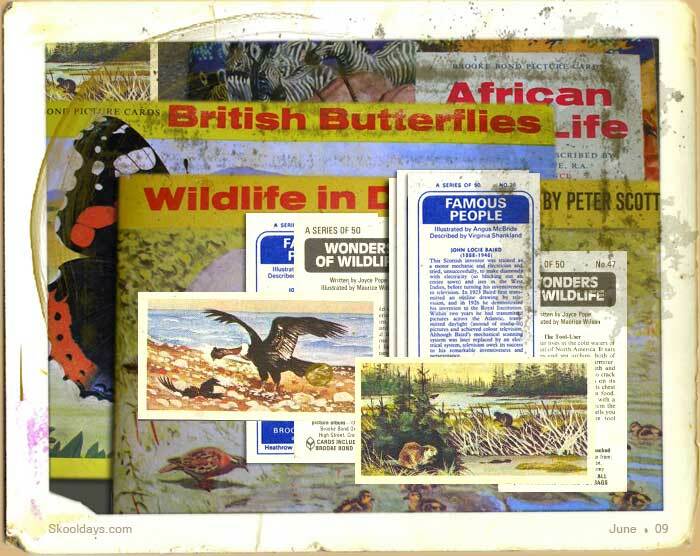 Did any one else collect Brooke Bond Tea Cards or something similar? I still have a huge amount stashed away and was a proud collector as a kid. Additionally I collected cards that came with crisps and candy sweets too. If it looked like a card I collected it. Even lollipop ice-creams started releasing cards to collect at one point, this was all a forerunner to bubble gum football cards and Pannini stickers. The history of Brooke Bond cards? well they recognised that people would collect them and remain loyial to the brand. Apart from the fact that PG tips is probably the best tea in my humble opinion, they released 56 different sets. Other favourites included ‘The Race Into Space’, ‘The Saga of Ships’ ‘The History of The Car’ and ‘Inventors Inventions’. One other trait that I seem to have kept as a result is an inexhaustible thirst for tea! No wonder Britain are such great tea drinkers! Brooke Bond was based in England and therefore many of the cards have a British theme to the series. For example Trees in Britain, British Butterflies, British Costume and the like would have a limited interest in the Americas. Though Red Rose in America did take the concept and adapted there sets according. This entry was posted in Pop Culture, Toys and tagged 1950, 1960, 1970, 1980 by Skooldays. Bookmark the permalink. I need to know the value of them. are they complete with album? i have always promised myself I would finish off the sets I have and swap out ones I don’t need. anyone else want to try to trade off? Whatever the worth of each card, they will be worth more as a complete set.